The bold statement by Diess didn't translate to what was seen at the 2018 Los Angeles Auto Show, an event where Volkswagen has a large booth in the south building, hosted a Beetles and Breakfast event, and gave a 30-minute media press conference. Also: CES 2018: For Audio Enthusiasts Too! Over in the West building, a completely different story is being told by the Ford Motor Company. No meals were provided, nor a press conference. Ford was primed and ready for the 10 consumer days that follow the media tour with potentially the biggest booth space of the show at a cost most likely in the low millions (those numbers are not given out). “Ford's entire focus in Los Angeles is consumer based,” explains Garrett Carr, Ford's global auto show and events manager. Ford plays on that thought process by building its own Blue Oval festival that attempts to create various experiences and stories. The extraordinary space has been sectioned off: trucks, performance, technology, green cars, SUVs, and a showroom that hosts test drives. 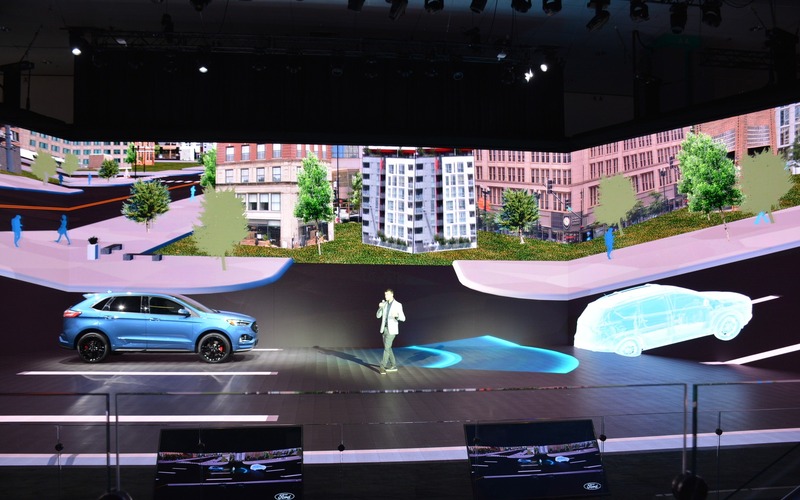 It's a modernized and future-looking strategy for Ford; one that will transport most of its components shown in Los Angeles to its core North American auto shows in Detroit, Toronto and New York. Additional conversations are being had for China and throughout Europe. The new direction is aimed at assisting the consumer with what they're specifically interested in, while making the whole experience a more comfortable and happy environment for the whole family. As a result, families will be inclined to stay within Ford's space for longer periods of time. Examples of these family-filled experiences are shareable, Instagramable moments including the Ford Ranger hanging sideways on the wall, a park with benches and plugs in its connected space, an adventure rope course for the kids in the truck section, a LEGO assembly area, and a chat bot within a vehicle that can answer all your product questions. That's already a lot, but the most eye-catching experience is a 15-minute interactive movie featuring physical cars and virtual reality visuals to easily demonstrate and fully visualize what safety technologies such as blind spot information system with cross-traffic alert or pre-collision assist with pedestrian detection actually looks like. Ford is one example showcasing an auto show movement towards experiences rather than hardware. In today's world, consumers are able to see what these vehicles look like both inside and out online, making static displays of the past—the bread-and-butter system of what made auto shows so successful—somewhat irrelevant. That was on full display at Volvo's booth, where the Swedish luxury automaker elected not to have one single vehicle in its booth. Rather, they talked about its partnerships with Google for infotainment and Amazon for in-car delivery services, its car sharing services, as well as autonomous drive technology and virtual reality interior experiences. Perhaps Volvo went a little too far, but the company was making a point to focus more on technological concepts without the need for a physical vehicle concept to be displayed that will never be built. Other manufacturers took a more subtle take on experiences evidenced by Nissan's Intelligent Mobility 360 VR tech drive or the Subaru Loves Pets initiative featuring a park for pets including a kissing booth for a charitable cause to raise awareness of animal welfare. Much like the next automotive vehicle launch, brands are searching to make an impact on auto show floors with new and innovative ways for its booth spaces to be more inviting and exciting, and within a smaller budget. Carr and his small in-house and agency team spent close to a year on this new interactive, open, and more visual booth concept after some prototyping at the New York International Auto Show and at the Ford-sponsored EEA AirVenture show in Oshkosh, Wisconsin. Final approval by the big boss, Ford CEO Jim Hackett, came only a month-and-a-half before the media days in Los Angeles. The discovery would be in the versatile benefits of shipping containers as great visual canvasses. Not only did they look industrial and cool, they are cost-effective: already coming set up, ready to ship, easily recreated at future shows, and they can be placed both indoors or outdoors, the latter becoming necessary when the Detroit auto show moves to June in 2020. Within these shipping containers, consumers in Los Angeles were able to see a full-car tease of the new GT500, to be launched at the Detroit auto show in January 2019, as well as a Ford Bullitt Mustang activation that allows people to recreate a scene from the movie Bullitt. The GT500 tease, along with some other showpieces will be replaced by something else at the next show, but the Bullitt display can fully stay intact for other upcoming events. The auto show experience is bound to evolve over time. Some will have hits, others misses; but currently, no company seems to grasp the fully interactive experience more than Ford. Volkswagen's Diess may believe auto show relevancy is dwindling, but just maybe it's visionary brands like Ford that can delve further away from static vehicles and flashy displays and generate interest through experiences to help legitimize decisions for both new and loyal buyers in the process. Galleries CES 2018: For Audio Enthusiasts Too! Los Angeles 2020 Lincoln Aviator Makes its Comeback Official in L.A.